The U.S. Food and Drug Administration is currently considering a ban on the sale and distribution of menthol cigarettes in the United States—a measure that could save thousands of lives each year and drastically cut elevated smoking-related health problems experienced by African Americans as well as lesbian, gay, bisexual, and transgender Americans who often bear the brunt of smoking-related diseases. For so many reasons, this ban is a no-brainer. In 2009 Congress directed the FDA to ban all other candy-, fruit-, and spice-flavored cigarettes but they fell short of eliminating menthol flavoring—even though it was believed to be the most widely used and highly addictive of all flavored cigarette additives. Instead, they mandated a comprehensive study to assess the impact of menthol smoking on the health of the general public, especially among our nation’s youth and minorities who smoke menthol cigarettes at the highest rates. 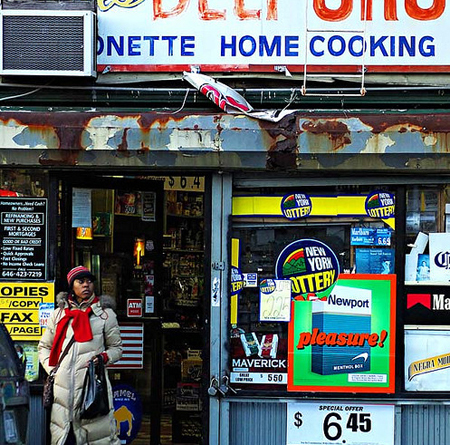 Removing menthol cigarettes from the marketplace would greatly benefit the public health. Menthol cigarettes lead to a lifetime of smoking. Smokers of menthol cigarettes find it easier to start and more difficult to quit smoking. Menthol deceives users into the false perception that menthol cigarettes are less harmful than nonmenthol cigarettes. 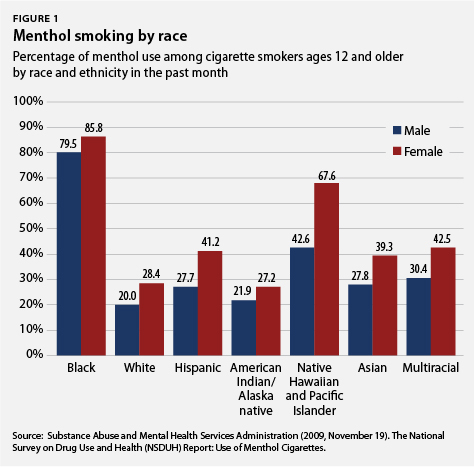 The availability of menthol increases the prevalence of smoking among African Americans. Predatory marketing by tobacco companies to youth, African Americans, and Hispanics also leads to the high prevalence of menthol smoking among these populations. The need for a menthol ban is further evident when exploring the impact of smoking on gay and transgender Americans. Research shows that gays and transgender people smoke at rates up to twice that of the general U.S. population. And it is estimated that lesbians, gays, and bisexuals are 30 percent to 200 percent more likely to smoke than the rest of the American public, a rate higher than that of all the groups evaluated in the Tobacco Products Scientific Advisory Committee study. Alas, no comprehensive data are available on how many gay and transgender Americans smoke menthol-flavored cigarettes or suffer the consequences because national health surveys, and most state-based surveys, too, lack questions of sexual orientation or gender identity. Nonetheless, we can deduce that gays, lesbians, bisexuals, and transgender people are just as vulnerable to smoking-related disparities as African Americans and other ethnic minority groups, which is why they should also be treated as a special population in federal health studies. Certainly, both groups would benefit from a ban on menthol for generations to come. And this is especially the case for gay and transgender people of color, for whom the scourge of smoking menthol-flavored cigarettes only compounds this assault on their health. This issue brief will look at the parallels in smoking-related health “disparities”—health care parlance for elevated ill health among different groups of Americans—faced by adolescents, gays and transgender people, and African Americans; examine why they occur; and highlight how a ban on menthol cigarettes will help bridge the health and wellness gap for everyone. All cigarettes, of course, are dangerous. Smoking is the single-most preventable cause of disease, disability, and death in the United States. Each year an estimated 443,000 people die prematurely from smoking or exposure to secondhand smoke, and another 8.6 million live with a serious illness caused by smoking. Mortality rates are even more tragic for African Americans and gay and transgender smokers who suffer the greatest consequences of tobacco-related illnesses alongside already elevated rates of obesity, high blood pressure, cancer, and other diseases that are inflamed by smoking. Blacks, for example, are more likely to acquire and die from lung cancer than any other group of Americans, and the American Cancer Society estimates that a minimum of 30,000 gay and transgender Americans die each year of tobacco-related diseases. Rates are similar for strokes and heart disease. For gay and transgender African Americans, the risk is surely even greater. Mounting evidence suggests that the availability of menthol cigarettes perpetuates the high rates of smoking among these minority groups, which result in these bleak health outcomes. There are currently 19.2 million menthol smokers in the United States, and more than a million of these smokers are adolescents between the ages of 12 and 17 (see Figure 1). More than 80 percent of all black youth who smoke use menthol—the highest usage among all minority groups—and more than 70 percent of gay and transgender youth smoke menthol cigarettes—also among the highest usage of all groups within this age group. The most effective way to tackle these appalling figures is to reduce the number of people who begin smoking in the first place. A ban on menthol cigarettes would effectively do just that. Here are the reasons why. Smoking and nicotine addiction is a pediatric epidemic, with nearly 80 percent of smokers having their first cigarette before the age of 18, and with one in three youth smokers projected to die prematurely from tobacco-related diseases. Research suggests that menthol cigarettes are the culprit, as menthol use is up almost 20 percent among youth despite a decline in smoking among the public overall. Black, gay, and transgender adolescents account for a significant portion of this increase. They smoke menthol cigarettes at rates considerably higher than the rest of their peers (see Table 1). 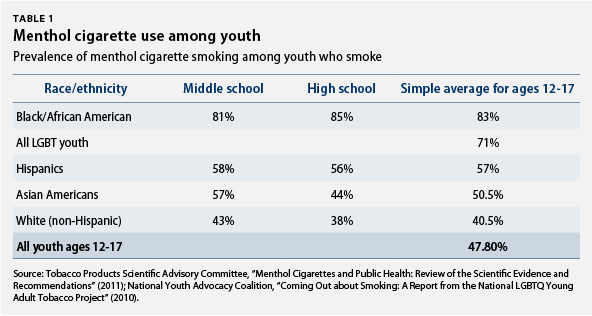 It’s not surprising that 50 percent of all youth who smoke cigarettes smoke menthols. Tobacco companies have long understood the allure of menthol to young smokers and have manipulated the levels of menthol in cigarettes to appeal to them. The minty flavor and cooling sensation masks the harsh tobacco taste and the peppermint effect eases inhalation, making cigarette use more palatable for youth and first-time smokers. This early exposure to menthol cigarettes contributes to the high rate of smoking-related illnesses and premature mortality within the general public, and among African Americans, gays, and transgender people in particular. That’s why youth prevention is essential to reducing chronic smoking-related diseases among the general public. Eliminating menthol from the marketplace will drastically reduce the number of young people initiated into smoking that grow up to be lifelong smokers, which will ultimately save an entire generation from such harsh outcomes. Contrary to claims by the tobacco industry, elevated rates of menthol use among these groups of Americans are not merely coincidental or a simple matter of smoker preference. Decades of tobacco industry documents reveal that African Americans, adolescents ages 12 to 17, and gay and transgender communities have all been targets of aggressive marketing tactics by cigarette companies who worked to position smoking as a cultural norm among these groups. These campaigns more often than not were designed to perpetuate stereotypes and exploit vulnerabilities of each of these communities. The tobacco industry continues these campaigns despite heavy criticism over the years for their predatory nature. This is why continued high levels of smoking among minority groups is now more than just a health and wellness issue but also one of social justice and consumer protection. Tobacco industry marketing tactics, for example, are historically condescending and downright offensive to minority groups who are also the most loyal customers. R.J. Reynolds Tobacco Company, for one, has painted African Americans as naturally unhealthy, disinterested in self-improvement, and unmotivated to do anything other than try and impress others. They’ve also targeted the Bay Area gay community through a campaign called Project SCUM, the name alone quite telling of the sentiment toward the community. Moreover, youth of color under the age of 18 are cited by the industry as a primary target, with menthol products heavily marketed to this group of Americans in order to loop them into smoking. The tobacco industry is preying on the next generation of customers and society is paying the price. Tobacco companies overtly target gay and transgender Americans in campaigns to hook them early and convert them into lifetime customers. And the high smoking rates of this group suggest the tobacco merchants are winning. Smoking among gays and transgender people is a health crisis, which is why policymakers must work now to develop culturally competent intervention programs and succession models to reverse the trend. Smoking becomes a coping mechanism to help them deal with these issues—issues that are further magnified for gay and transgender people of color who face discrimination due to both race and sexual orientation or gender identity. Moreover, gays and transgender people disproportionately socialize in bars and clubs where they face less discrimination but where smoking remains prevalent. For many in this community, bars and clubs are often the only social outlets they have to connect with other members of the community, so whether smokers or not, they are still subject to the harms of secondhand smoke. Whatever the case, we know smoking is highest among gay and transgender Americans, with rates ranging between 25 percent and 50 percent. A recent report also found that 30 percent of transgender Americans report smoking daily or occasionally, compared to just 20.6 percent of all U.S. adults. Additionally, lesbians and bisexual women are the only group of women whose smoking rates exceed their male counterparts. In the general population men smoke much more than women, but one study found that lesbian and bisexual female youth were more than nine times more likely than their heterosexual classmates to have smoked in the last week. There was no difference found between smoking among gay or bisexual male youth and their straight classmates. The magnitude of the harm caused by the availability of menthol to the public health is striking. According to the independent Tobacco Products Scientific Advisory Committee estimates, 9 million more people will start smoking over the next 40 years due to the availability of menthol cigarettes. If trends hold true, we can then anticipate that the majority of these new smokers will be black, gay, or transgender. This is well beyond the number of new smokers that would take up the habit, whether menthol were available or not. Should menthol remain on the market, more than 325,000 premature deaths will also result and millions will be faced with the excess burden of morbidity stemming from chronic diseases, infectious diseases, and diminished well-being that is attributable to smoking (see Table 2). The good news is that the majority of menthol smokers report that they will stop smoking altogether should the FDA ban menthol cigarettes. A study by the National Cancer Institute found that almost half of African Americans polled said they would quit smoking and not use any other tobacco product if menthol were banned. Seventy percent of transgender smokers reported the same. No data is available on cessation plans of lesbian, gay, or bisexual smokers. In summary, a ban on menthol would avert more than 300,000 premature deaths and divert 9 million people away from smoking over 50 years. It would also lead to a 50 percent reduction in the smoking prevalence among African Americans and a 70 percent reduction for transgender Americans—saving lives, bridging health and wellness gaps among minorities, and reducing health care spending across our nation. This is a win-win for every American. The U.S. Food and Drug Administration should unequivocally ban the sale and distribution of menthol cigarettes in the United States. This would unequivocally reduce the overall smoking prevalence among all Americans and the disproportionate use of cigarettes among minority Americans. The National Tobacco Control Program of the Center for Disease Control and Prevention, which coordinates and funds the national effort to reduce tobacco-related diseases and deaths, should ensure adequate funding to states to implement culturally competent smoking intervention services, cessation programs, and quit lines. In light of a menthol ban, the CDC should allocate a substantial portion of the proposed $79 million in the fiscal year 2012 budget for antitobacco media campaigns to menthol-specific education campaigns and support services for the hundreds of thousands of current users expected to quit. The CDC should also give special consideration to Community Transformation Grant applicants working to reduce menthol use and smoking in general among African Americans and gays and transgender people. The proposed FY 2012 budget for these grants is $221 million. Congress should allocate some of this funding to support the menthol ban. In order to fully assess the impact of health disparities in general, and smoking specifically, on this group of Americans, accurate population-based health data is necessary. We call on the FDA, the Department of Health and Human Services, the Center for Disease Control, and other federal agencies to include questions of sexual orientation and gender identity on national health surveys so we can learn more about how smoking in general affects this group. Just as racial and ethnic minorities receive “priority status” in review of health disparities, so should gay and transgender Americans. The availability of menthol cigarettes in the marketplace leaves both African Americans and gays and transgender people vulnerable to smoking-related health disparities and predatory marketing by tobacco companies. A shared interest in combating this scourge presents a great opportunity for collective advocacy by organizations representing both groups to promote smoking cessation in general alongside measures to reduce health disparities among minority groups in particular. Doing so will help bolster working relationships and foster partnerships that can be leveraged toward collaborative work on other policy issues. Aisha C. Moodie-Mills is the Advisor for LGBT Policy & Racial Justice at the Center for American Progress. Her work with the Fighting Injustice to Reach Equality, or FIRE, initiative explores the impact of public policy on gay and transgender people of color.